Tim Blades explains how he made the draco. 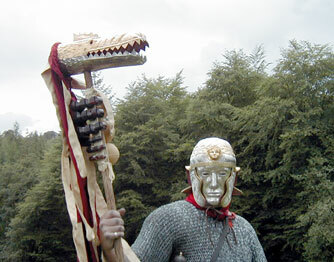 When I got a call from Ros Ereira at Time Team asking if I could make them a head for a draco, my first question was 'What is a draco?' She put me onto a website for a German museum where there was a good example and a scale plan and even though it was much larger than I was used to I said I would have a go at it. The first thing I did was to make a rough cardboard one to see how big a bit of metal I would need, and I hammered out a trial piece of copper to see where it would stretch and how far I could shape it, especially around the nostrils and eyebrows, which were the widest areas. The draco would originally have been made out of sheet bronze, probably in a workshop in Rome, and issued to the cavalry to take with them. Studying the photos of the one in the museum it became obvious that the bulk of the work was in the top half: the bottom was a fairly straightforward tray with a raised edge for the teeth and shallow scales. In their day, producing pieces of bronze sheet large enough and thin enough to form into the correct shape would probably have been the hardest part of the job. 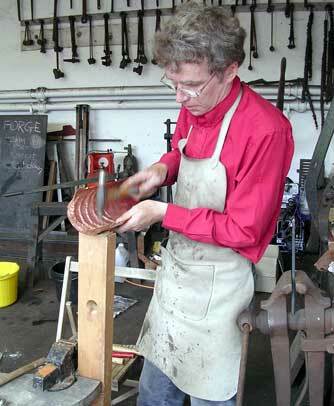 I found it difficult to find a suitable piece of bronze, so I eventually elected to make it in copper. To do the job in two days meant that I needed a metal I could rely upon to be straightforward to work. My first trial piece had come out with the nose much too short  I had underestimated how much I would need to curve around for the nose, and it did not have enough metal for the eyes. Apart from that, the tool I made to do scales  from a piece of water pipe!  was a great success, and I could see that if finished it would look a lot like the original. Starting with two roughly rectangular pieces of copper, three or four hammers, a few punches, a sandbag and a couple of blocks of wood carved to a suitable shape, it was a relatively simple operation  if a bit slow. In the early stages it looks like a rather battered old car bumper, but as soon as the form takes shape you can see where more work has to be done. As you stretch and bend the metal it 'work hardens' and has to be softened. This is called annealing and is done by heating the metal until it glows and then quenching in a weak acid. This has to be done many times during the process  otherwise the metal would crack. When the main shape has been formed and looks about right, finer details can be put in. The ridge around the nose, the nostrils, eye sockets, brow ridge and raised ridge around the teeth are not cut until the end to allow for any adjustment. Next, the scales are stamped in and their shape improved, while the eyeholes and the hole for the pole are cut in with a chisel. A similar but much easier job was done on the lower half at the same time, to keep the line of the mouth the same. It was most important all the way along to make sure that the mouth would be wide open at the end. The final shaping was to put a raised rim around the back end to carry the tail. The draco was now ready to be coloured and after a good scrub with a brass brush the bottom half was fluxed and heated so that molten tin could be spread on with an old rag. 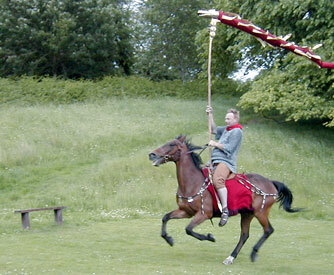 This had to be natural fabric only, as polycotton melts  not a problem the Romans would have had! Originally the top half would been firegilded, which involves mixing pure gold with mercury, rubbing on as a paste and evaporating off the mercury. This is not at all good for you! So I used a modified 'pen-plating' system where you 'paint' on the gold in a conducting solution wired up to an electroplater. This took about 3.5 hours and at first did not seem to be working at all well. After a pause and a clean with a brass brush, however, it improved considerably, and at the end it really gleamed. 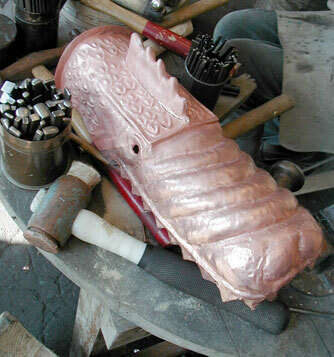 The draco was then put together with rivets, which were plated over, washed and had its tail put on. My judgement of the original, having made a replica, is that the Romans would not have spent a great deal more time on it than I had  maybe another couple of days to do proper repousse work to get better detail on the scales, eyes, eyebrows and so on. This was a government-issue job, made down to a price and finished with a flashy plate. Gold paint was the 'go-faster stripes' of the Roman empire! Making the Time Team Draco is Copyright � 2005, Tim Blades. All rights reserved. Used with permission. Tim Blades making the head.